Demantoid? That’s kind of a satanic sounding name. The guy who named that stone must have been color blind because they’re green, not red. Oh well, the Russians named it and used the Dutch word for diamond, “demant”, and the Greek word for alike, “eidos” and mated them together to get “demantoid”. Discovered on the banks of the Bobrovka river in the central Western Ural Mountains in 1868 the stone quickly became popular among Russia’s elite due to its high indices of refraction and superior color dispersion to that of even diamonds. Demantoids are the green version of andradite garnets, a calcium and iron rich silicate mineral. Garnets are defined in a weird way; they are called “solid solutions”, meaning that the stones will always have a the structure of (SiO4)3 contained with in it, but will be bundled with a different series of atoms to form the particular molecule of the different garnets. In the case of Demantoids, the molecule looks like this: Ca3Fe2(siO4)3. I know it is a bit technical, but bear with me. The Urals are a mountain range born of collision. They form the seam where the continents of Europe and Asia bonded and made the super continent of Eurasia. When two continents collide everything gets all orogenous. As the two massive hunks of Earth merge they have two options: 1) if they are of different densities the denser of the two will subduct (like what happens off the coast of Washington and Oregon between the dense Juan de Fuca Plate and the lighter North American Plate; or 2) if the are the same density (like two chunks of continent) they collide and start to push up as they attempt to override the other equally-matched mass of rock. We can see this happening today in the Himalayas where the Indian Sub Continent has slammed into South Asia. The big collision that formed the Urals was about 250-300 million years ago making these mountains among the oldest on the planet. At one time, when they were a young whipper-snapper, the Urals may have approached 30,000ft in altitude like that of the greenhorn Himalayas. Time, combined with weather, has reduced the Urals to but a 1,500 mile ridge of hills today ranging from 1,100ft to about 6,000ft at its highest. When Europe and Asia collided and formed the Urals a lot of rock cooking happened. When continents collide and form a mountain range, a bunch of earth is uplifted and piled upon more earth like wrinkles in a bed sheet. When rocks are buried miles deep they come under great pressure (how long do you think you would last as the bag full of water that is your human form if you had five to twenty miles of rock piled on top of you? ), and fantastic temperatures. Sometimes the temperatures can be in the thousands of degrees! This heat and pressure metamorphizes rock; essentially there is enough heat and pressure to change the chemical structure of the material, thus creating new minerals in the process. 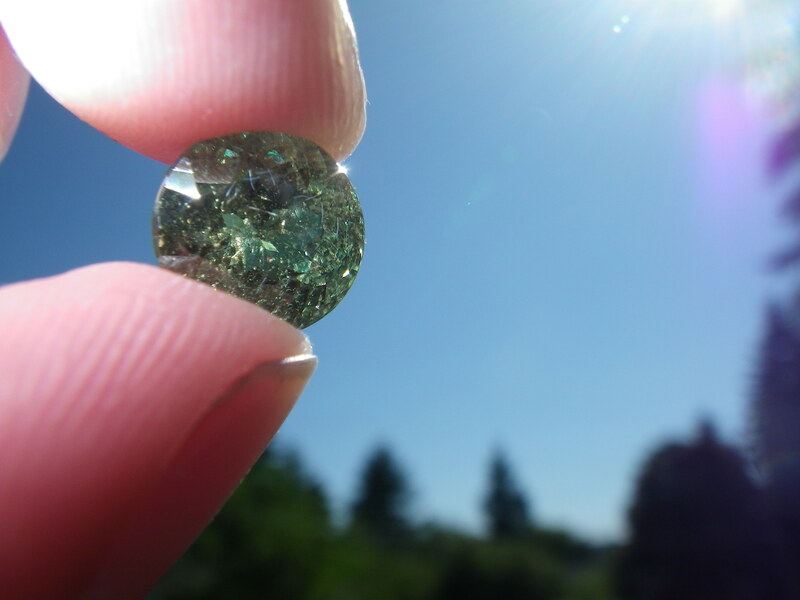 Metamorphosis is how andradite garnets appear into being. When the limestones that formed the seafloor between the two colliding continents merged and squished, the added heat and pressure caused mineral leaching. In Russia, this just happened to occur with some squishing serpentinites (soapstone). 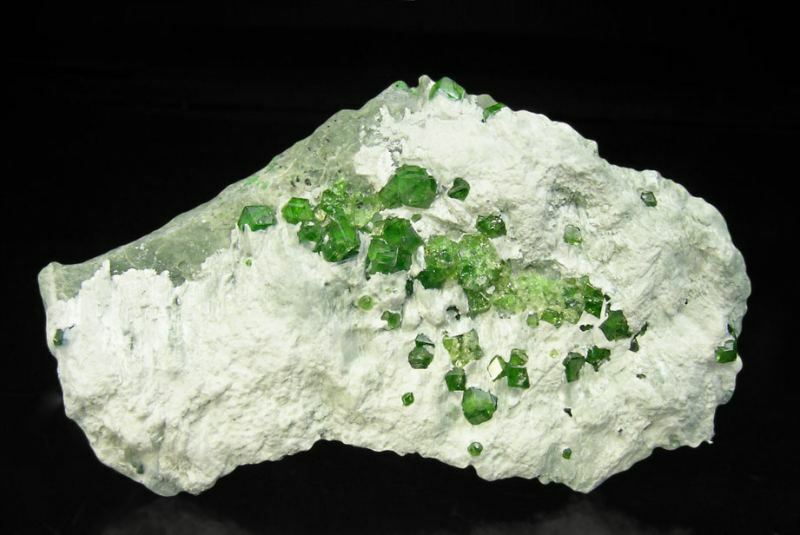 The calcium and iron from these two stones bonded to form the solid solution with the oxygen and silica, that is the basis for all garnets, creating the demantoid. The special thing about the Russian demantoids is that the serpentinite cased the garnets to form around this stuff called chrysotile which is a form of asbestos. 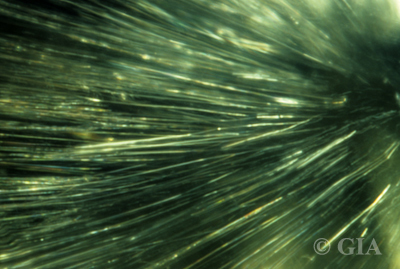 The thin, long strands of chrysotile make wispy curved inclusions in the stones that look like horsetails. The demantoids with these inclusions are simply known as horsetail garnets; and they are worth a lot of money. From the time demantoids were discovered in 1868, up to the Communist Revolution in 1919, Demantoids were wildly popular. Even famed jeweler Peter Carl Fabergé (of Fabergé Egg fame) regularly incorporated demantoids into his pieces. After the revolution jewels were not much of a concern for Soviet population. Mine production in the Urals started once again in the 1970s when it was realized that outside markets were demanding this extremely rare stone. Some mining in the Urals carries on today, and rarely some Russian stones can be purchased at auction. More recent discoveries in Namibia (1996), Madagascar (2009), Italy, Iran, and Afghanistan have come on to the market. The Jeffrey Mine in Quebec, Canada is producing some of the largest, most beautiful demantoids ever seen. 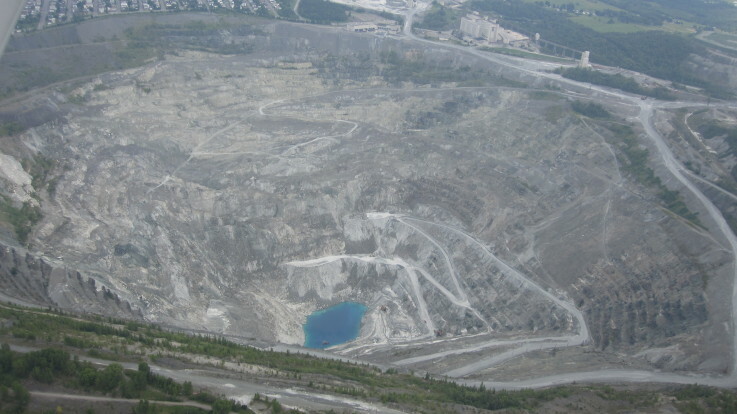 The Jeffrey is the largest asbestos mine in the world and a big source of contention among Quebecois. The Jeffrey Asbestos Mine is the largest open pit asbestos mine in the Western Hemisphere. It is a fantastic source of mesothelioma and garnets! Most Demantoids are incredibly small with most gem-quality cut stones being under 1ct. Stones over 2cts are rare, and stones over 3cts are incredibly rare. Noosphere Geologic has in its private collection a 5.4ct round-brilliant cut Russian horsetail, as well as a 1.32 oval cut Russian demantoid. We also have several larger uncut stones in matrix from the Jeffrey Mine, and from Madagascar and Namibia. The value of demantoids are generally very high. Eye-clean Russian stones larger than one carat can easily fetch $25,000 to $50,000 per carat, while stones with visible inclusions will get between $1,000 to $5,000 per carat. The largest eye-clean Russian demantoid is only 8cts and worth upwards of one million dollars. The largest single stone ever found was a Russian 252.5ct ugly green blob. In the United States there are several potential locations in the Southeast, Montana, California, and even my home state of Washington where old asbestos mines exist. If you are going to look, be careful. Wear masks if recommended, and if you see the long fibrous strands of serpentine (different that serpentinite or soapstone) get out! Previous PostThe Rare Gem Series: Spinel (The Balas Ruby)Next PostProgress, Regress, and Continuation. I have a demantoid russian horsetails .